All of the fans of the Brandon Lee (late) have an opportunity to honor his memory by wearing his long costume as Eric Draven which he wore in his last movie- The Crow. Brandon Lee played the lead role of Eric Draven. Eric Draven coat just like the movie itself, give hint of drama and mystery. 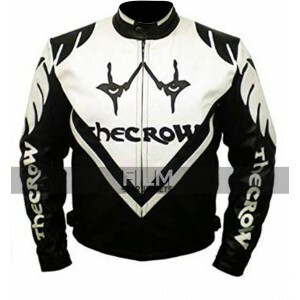 Eric Draven the crow costume is made of the pure leather. It has a lapel collar along with a unique style of button lined on the front side. The design of this Eric Draven costume is mystic. The stitching of the costume is great. The front side has two pockets on the waist. So, what are you waiting for? Get hold of this Eric Draven costume and add some charm to your life. "I am very happy that I bought this coat. It has turned out to be even better than it looks on Eddie Redmayne in the pictures that have been released s"